One of my all time movie faves is "The Last Unicorn". So I was absolutely delighted when it was the chosen theme for this round of Enchantment. The dress I am wearing is by !gO! 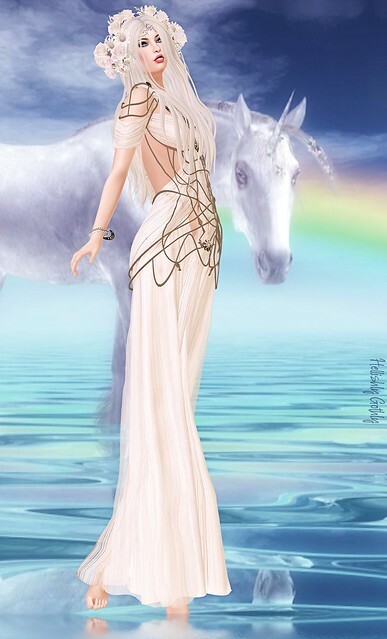 and is actually from this round of The Fantasy Gacha Carnival, though it fits the Last Unicorn theme extremely well. It is a gorgeous dress that is equally at home with roleplay as it is with being a lovely summer dress you can wear almost anywhere. There is two versions, sheer, and not sheer. The "chains" around it also come in two metals, gold, and silver. 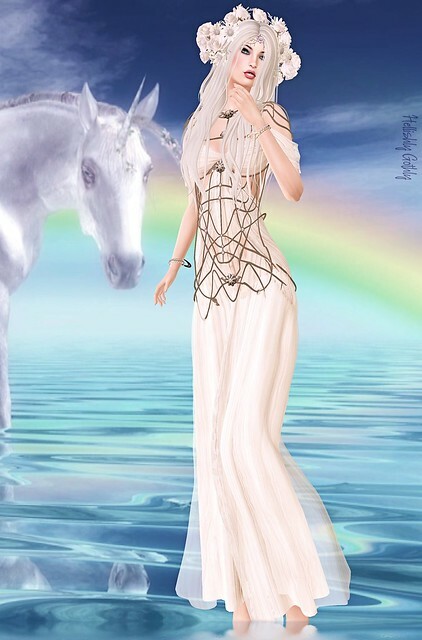 I am wearing it here with part of the fabulous "Unicorn" set by Naminoke available at Enchantment. The set comprises a very pretty, and feminine floral head wreath of daisies and roses in white, a forehead chain and flower ornament, a forehead chain and horn combination (not shown), and a necklace (not shown). The matching bracelets are the Hunt gift for the event. Lastly, but certainly not least in any way is the Amalthea skin by Lumae, also for Enchantment. It is part of her new Eirtae skin range, and really is absolutely beautiful. It comes with almost any applier you could ask for, which is fabulous because you don't then have to go pay more to get the extras. I am wearing it here on the Alex head by LOGO. Trunk Show, Shiny Shabby & Cosmetics Fair, Oh my!